The cozy feelings that Autumn evokes are what I love so much about the season, with the warm hues of yellow, orange and red leaves on the trees and the glow of a toasty fire offering respite from the crispness of the air and the darker nights. And, it's hard to not get excited about all that is ahead...favorite fall recipes, the holidays, and wool sweaters to keep us warm. We've been storing our pumpkins on the mantle. We'll use them one by one in the coziest of recipes. Here's our favorite pumpkin. 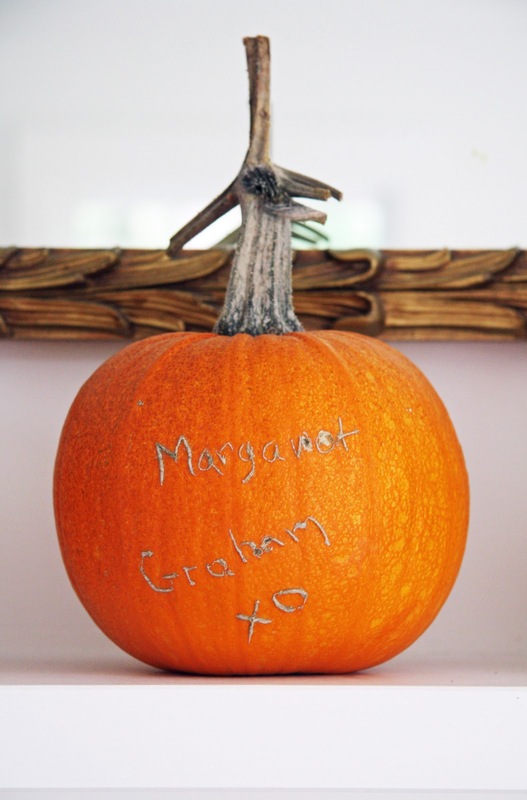 After carving Graham's and Margaret's names on it we've watched it grow through summer into fall. We'll bake a pumpkin birthday cake for their one-year birthdays next month. Our other favorite pumpkin recipes are pumpkin soup, pumpkin bread and pumpkin pie. 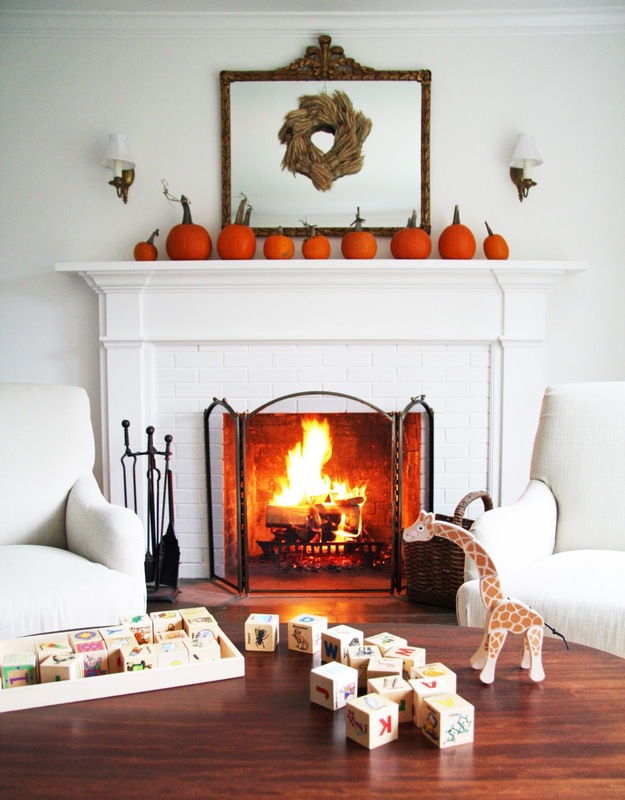 Even a wooden giraffe enjoys a nice fall fire. The babies have grown so much, they are darling! 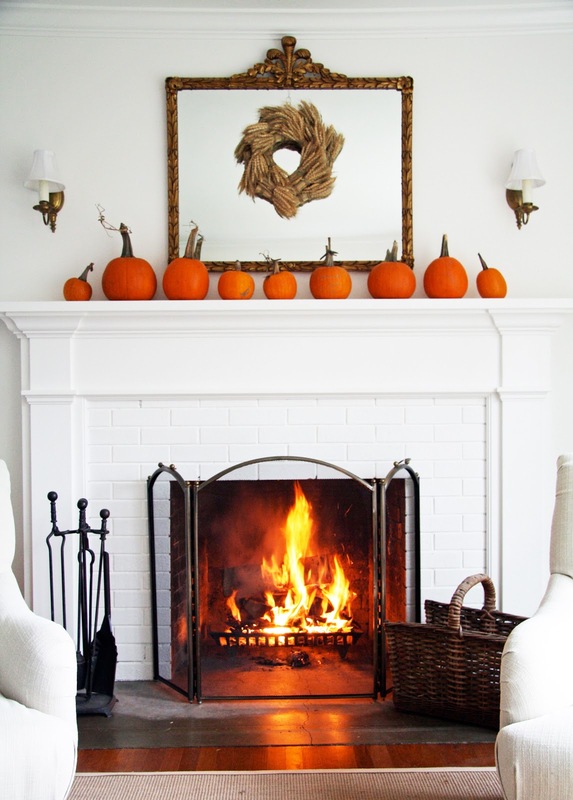 Love the simple mantel, the pumpkin give a pop of color that's perfect for fall! I'm so jealous, we don't even have a fireplace in this house! Yours is lovely, and oh my have your little ones grown...so cute! I love your autumnal fireplace with the pumpkins and I especially love your babies, they look cute! Happy autumn evening! love you pumpkin post too! That picture is a framer! Thanks for the dose of toasty warm fall ideas. All of your pumpkins are delightful! Lucky you! A beautiful autumnal setting. Hard to believe the babies are almost one. Your mantle is perfect, love the straw wreath and the carving with Graham and Margaret's names is unique. I would love to kiss those little toes. Your almost one year olds are scrumptious! I love, love, love that wheat wreath on your mirror over the mantle. Did you make that? Only you could make white look sooo cozy! The addition of babies and toys completes the picture. What a cute idea! Love the mantel! Lovely post...and yes those last three are just darling!! This really is a beautiful post...you have such a lovely family and home!! Enjoy fall! Amazing post....M and G are getting so big!!! Love the glow of the fire! Your pumpkins are adorable! All three look happy in their element all snuggled in the chair. Snuggling up by the fire is one the best things about autumn. Your pumpkins look so festive all arranged on your mantel. So pretty. Absolutely beautiful. Where did you get the giraffe? My 2-year-old is all about giraffes lately. Thanks! The pumpkins look so wonderful on your mantel Trina...and the babies pumpkin turned out so sweet. One day Graham & Margaret will see this and be so thrilled...I hope this becomes a yearly tradition, it's so special. Love seeing all the toys...and of course, the babes with their daddy! I knew I could come here for some cozy comfort. The making of a birthday cake from the M&G pumpkin is a wonderful tradition. I hope you continue that every year. It's so sweet! the carved pumpkin is such a great idea! I will have to remember that for next year's garden pumpkins. OH your sweet children are growing so! Love your fireplace! The wheat wreath is something I found at Home Goods several years ago. I bought two and love hanging them this time of year. Yes we are spending both holidays at home. Family is just too far to brave traveling! The giraffe is from Melissa & Doug - they're online but sell their toys just about everywhere. sweet, sweet, sweet!! love your pumpkins! Oh you and all of your "pumpkins" are just precious! You are all so blessed! LOVE the fireplace with all the vibrant hues around! Happy Fall! Adorable -- from the pumpkins on the mantel to the three pumpkins posing for their photo! I hope you'll post some photos of the babies' first birthday! This post was so poignant....I just loved it! You are blessed. So are we... that you share it all with us! Have just found your blog - what a lovely home and family you have. My husband and I also battled infertility for years and have been lucky enough to have 2 beautiful girls (one from IVF, the other a total and utter natural surprise at the age of 44!). Its spring here (Australia) but I love your Autumn fire. I look forward to reading about your winter as we swelter over the coming months! Well hello cute babies! With extra cute little toes and extra cute chubby cheeks! I want to paint my brick at our fireplace white. What color white is your fireplace painted and what color is on the wall. Looks lovely during all the seasons. Oh every single one of your pumpkins are just divine - well done on all of them!! What are the most beautiful babies! It has a beautiful home, the urge to go there to see my! You have a nice blog! I follow you! The most beautiful pictures I have seen in a while. Loved this post. The mantel looks beautiful with the wonderful little pumpkins. Margaret and Graham are adorable. I can't believe they are a year old. Our three girls are in their twenties, but I have so MANY fond memories of those early years. It was truly the best time of my life. The pumpkins (both kinds) look warm and cozy in front of that beautiful fire. I like how you have painted everything white to make the colours in the accessories in the room really pop. I love how comfortable your babies are on your husband's lap - it's clear they spend a lot of time there! And Margaret's left foot pointing off in another direction - adorable!!!! Your babies are so cute! Just wondering...I'd like to paint our fireplace brick white but am worried that they will turn black from the smoke. Have yours ever discolored? Your pumpkins are absolutely adorable:). I can't believe they're going to be a year old!!! It's too fast! Your home looks so lovely, all decorated for fall. And I love the Melissa & Doug toys by the fire- so cozy:). Enjoy your pumpkin recipes, and please share!! Love your pumpkins on the mantel and your beautiful little pumpkins! I can't believe they are almost one! Ours hasn't discolored so far although I wouldn't mind if it did. I like the worn in look a bit more than the freshly painted white. I love the photo of Daddy with his two pumpkins! So sweet. What a wonderful happy life you lead. You are so very blessed. Your little pumpkins are so sweet - the precious little ones who have blessed your life! Oh my what wonderful pictures - the children are growing so! Just got my copy of the December issue of Country Living Magazine. So beautiful - I just love the entire spread - gorgeous! As I read and looked at each charming page, I felt like I was looking at my friend's house - so proud of you and your sweet family! Hvor ser det hyggeligt ud ved pejsen. gorgeous pictures, and everyone looks so happy! Trina, such terrific pictures. We love your style! And, hubs is pretty cute, too! Happy autumn, Happy birthday, and Happy Thanksgiving! Just a note to let you know I enjoyed your spread in the Country Living Magazine.I too live in the country close to Portland. Will write back to you asap! And congratulations on the Country Living feature, I hope I can get my hands on a copy over here. Love, love your fireplace & mantle decorations. The simplicity of it far outshines all of the overdecorating I have recently seen. Great job!! I just saw the lovely article about your family and house in Country Living Magazine. Well done. I couldn't wait for my Country Living to arrive in the mail. It finally came on Saturday, the spread on your home was amazing. It is so beautiful, your blog is my all time favorite. Have a wonderful holiday with your family. I know I can't wait until mine arrive, I have 2 grandsons...they are 3 and 1. Mickey in PA.
Do they sleep with you all?